Aello is the lead female character in fiction Chronicles: Prelude of the Midnight Sun. She is the harpy familiar of Renn and followed him through fiction Chronicles: Requiem of the Twilight Stars. She began her journey to find Sauron, where she traveled with Sleipial and Leonide. In battle, Aello wields forged claws attached to her legs and employs hit-and-run tactics. 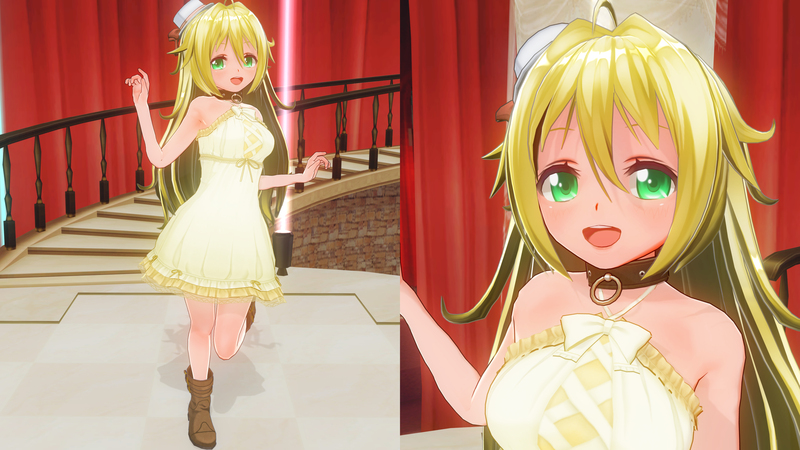 Aello has spring green eyes and a long vanilla hair. She was previously spoiled and lazy, but when she became Sauron's familiar, she learned how to serve as well as enjoying even little things. Once in a week, Aello lays about 1 or 2 eggs. These eggs are unfertilized and Sauron always helped her in laying the eggs. Aello does not mind that Sauron cooks the egg after. Aello cannot cook and does not mind raw food. She usually hunts for raw ingredient for the party to cook. When idling in a town, she is usually perched in a park tree. She cannot earn money on her own, thus Sleipial usually takes Aello to do errands in hunter's guild. Aello's journey represents her personal destiny. No matter how much responsibility she takes for her actions, somethings are completely out of her control. 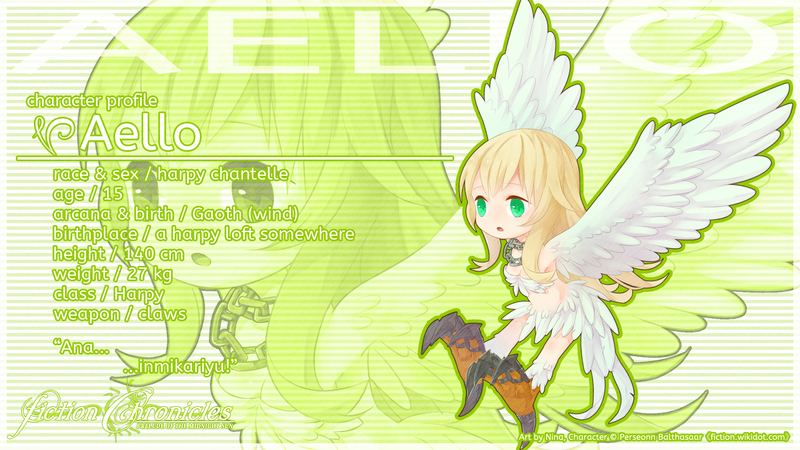 Aello's name was taken from the Greek mythology of three harpy sister. She is 15 years old during the event of Prelude of the Midnight Sun, 140 cm tall and weighs 27 kg. Aello's main design point is her collar, a sign of her familiar pact with Renn. Starting from Soulcalibur V, her concept has finalized. 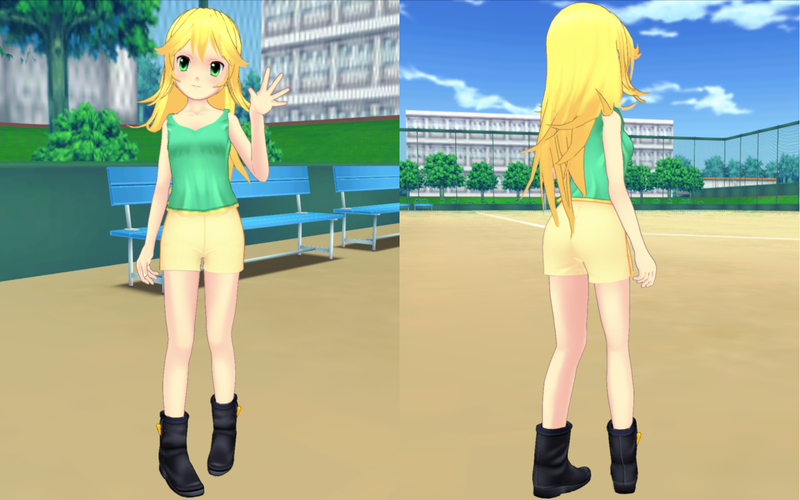 She has a wind-spread hairstyle, refer to her ジンコウガクエン2 hairstyle in the Alternate Media section. 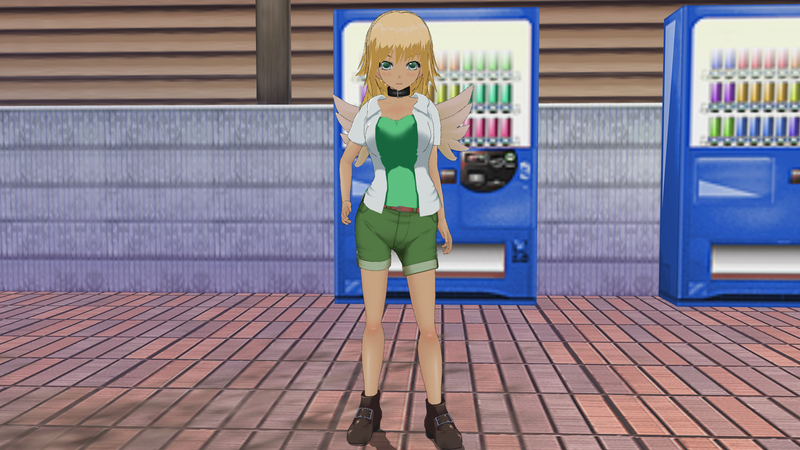 I did the best I can to represent her, since there is no way to properly make harpies. She also uses talons strapped to her feet (like Chocobo in Mysterious Dungeon 2). 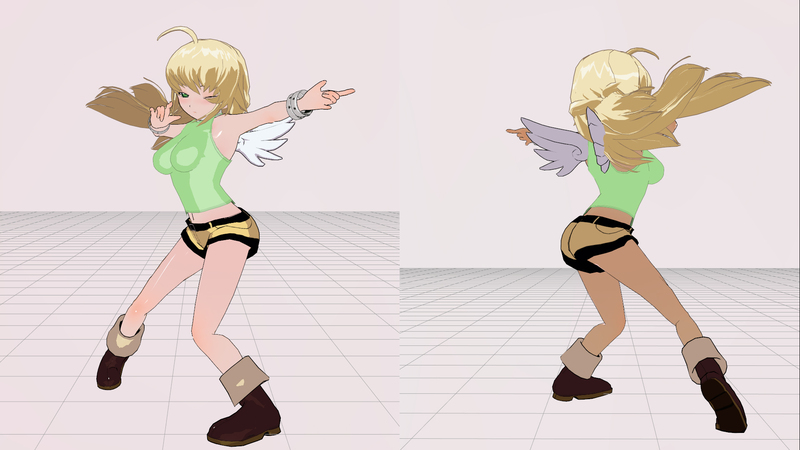 This was Spica's Ivory Gladiator costume, but recolored a bit to make Aello. She is one of the characters that was made after appearing first in Soul Calibur IV. The Steel Gauntlet's 2nd color can be colored using All and must be entered first. 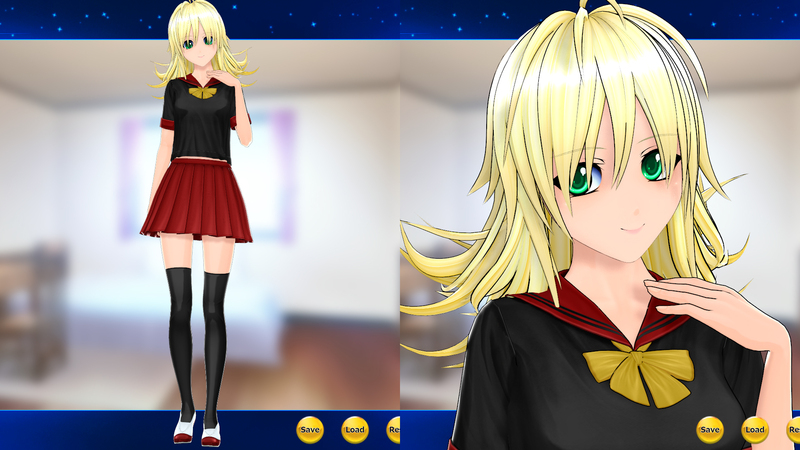 I did not use the wings because I could not make her without a collar. She can either use Talim or Tira, since both represent agility. 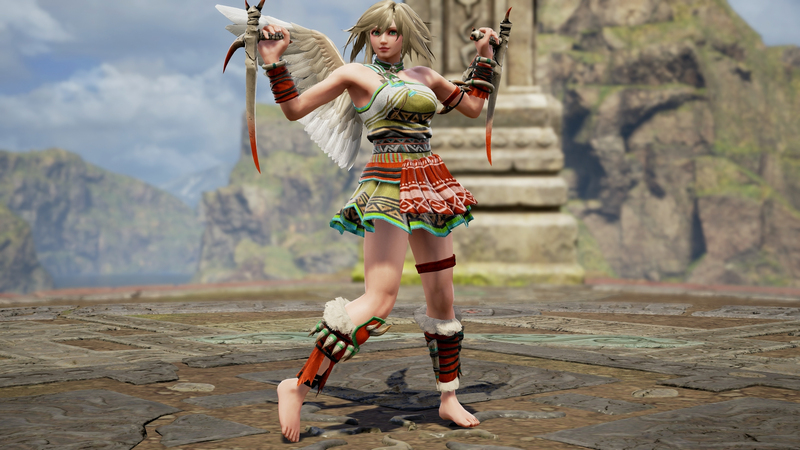 I feel that this is more like a butchered version of her Soulcalibur IV rendition, still I made it up with a decent color. 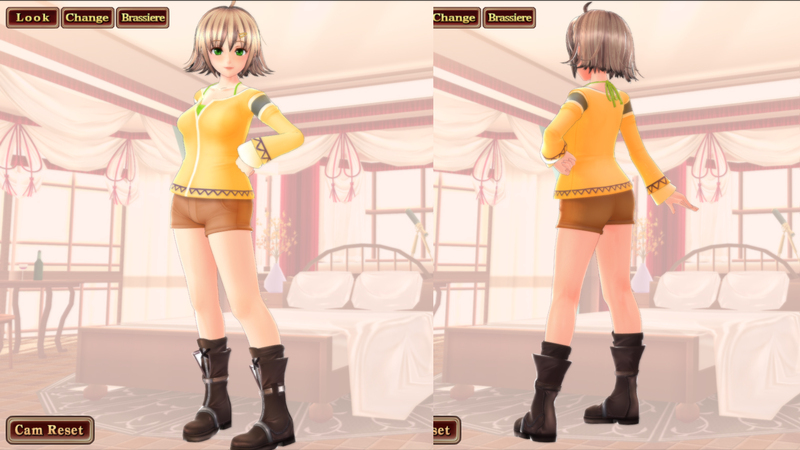 The Costume 2 is made by Tanleeseng, and is way better than my attempt to just convert her costume. Great work, Tan! 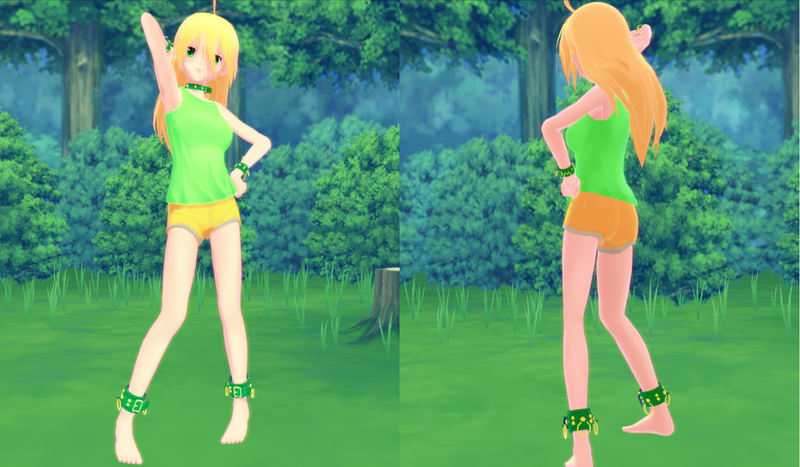 The yellow sundress is a homage to Selphie Tilmitt from Final Fantasy VIII; this is the silhouette I think best for her at the moment, since Renn is supposed to take a good care of her. The Costume 2 is her first Soulcalibur V costume as an update from her Soulcalibur IV costume. 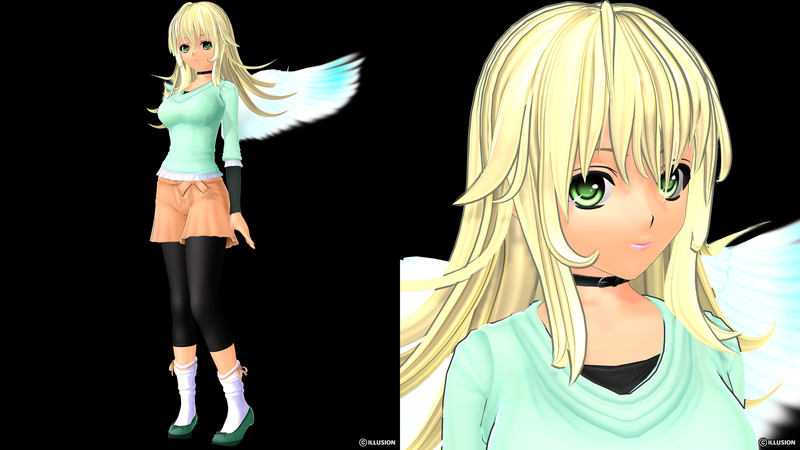 A good thing is that I can put her wings since chains are counted as accessories. The Costume 3 is a concept for her transcendence form called the Queen Aello. The tattoo is the Seal of Flight, which is required for a harpy to wield the Queen garb. 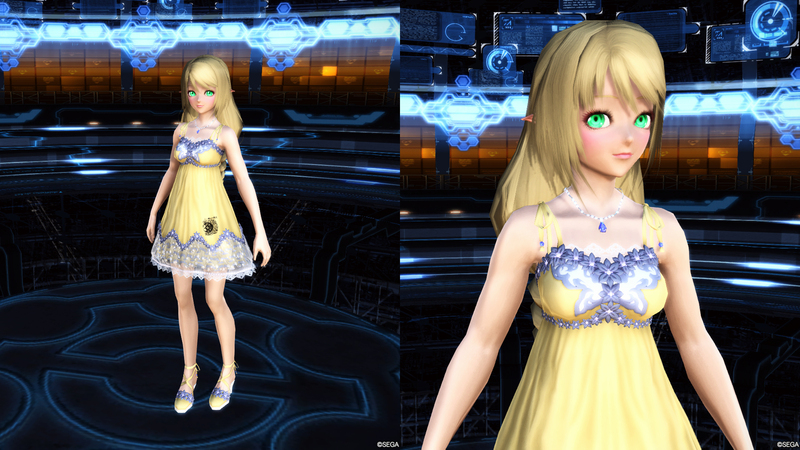 The Costume 4 is a homage to Shin Megami Tensei's Moh Shuvuu. The highlight of this outfit is the dead-bird hat. I tried to make a fitting beak using various accessory before setting on the simple heart, making the bird look like something from Angry Birds. The Savanna Dress caught my eye the first time and reserved it for her and most likely only her at the moment. Compared to her Soulcalibur V version, she has bigger physique. She is based on her Soulcalibur IV look, complete with headgear. In Dynasty Warriors 7, Boomerang was chosen for the overall agile look. In Dynasty Warriors 8, the Sabatons is closer to what she uses. The Samurai Warriors 4 rendition does not sit well for me, except her accurate moveset. Stay tuned for update!